Hopefully a number of you have been able to profit from the occasional tips that we have been able to obtain from two knowledgeable and experienced horse racing pundits, Carl Nicholson and Mark Foley. For the weekend just gone we sent out info on a couple that Carl felt had solid chances. The results of which were Howyadoingnotsobad (2nd 5/1 beaten a nose) and Power (Won 5/1). This was no flash in the pan for members of the Betting Insiders Club who as part of their comprehensive package have access to quality information such as this on a day to day basis. An overview of Carl and Mark’s individual and profitable approach along with the latest profits summary can be found further on. Before we move on to the outstanding results the winning duo have delivered we have a quick update from the Insiders Club. 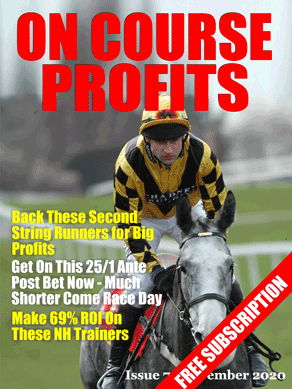 Issue 86 of the Betting Insiders Members Report which is due out soon is really taking shape with a number of the key articles already with us. The quality 52 page report is published in a handy A5 format and will include angles for the Group stages of the Euro 2012 tournament, as well as a profitable method for trading in-play on the overs/unders goal markets. The horse racing action will be extensively covered with contributions from regular authors Ben Aitken, Dave Renham and of course the aforementioned Mark and Carl. We will also have the key Race Profiling trends for the big meeting from Royal Ascot. We firmly believe that this edition will be another cracker which will be both an enjoyable and insightful read and one that will help punters on their journey to consistent profits. Now let’s return to the topic of the two horse racing pundits both of whom have been in cracking form of late. Carl’s approach is very much value based aka “Pricewise” but in his own unique style such as the gem he unearthed recently in the form of Morocco Moon who won at 28/1 and even after the Rule 4 deduction added +24.50 pts profit to an already tidy tally. Mark Foley is a trainer trends guru of the highest order and makes it his business to get to know the various methods that these creatures of habit adopt year in year out. His daily insights cover race type, course records and market intel and each potential qualifier is checked out for suitability before a shortlist of the best ones are put forward along with staking and bookmaker pricing available. Their combined selections during the last few months have delivered +54.82pts profit from simple level stakes which even at a tenner a time is +£548.20 is a figure not to be sniffed at.